Even though it's not a multiplayer game, Xbox Live still tracks what connected consoles are playing. And they are playing a lot of Skyrim. Each week, Major Nelson a.k.a. Microsoft's Xbox guru Larry Hryb, lists the most popular games on his service. Usually, such lists are dominated by online shooters with a random sports game or two thrown in. Last week's list is no different, with Call of Dutys Modern Warfare 3 and Black Ops in the #1 and #2 spots respectively. The anomaly is Skyrim sitting there in the tertiary position. Not bad for an uber-nerdy fantasy RPG. What's even more amazing is that Skyrim has no multiplayer component, but Major Nelson's lists track consoles that are connected and signed into Xbox Live even if the games are not actively played over the online service. That means that Skyrim is the third most popular game on connected Xboxes - not a small feat - but I wonder how the player numbers would compare if unconnected Xboxes could be tabulated. 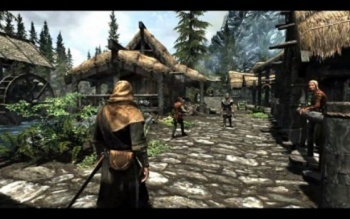 Would Skyrim beat out MW3 then? I hope so.